On Monday, Schiaparelli Creative Director Marco Zanini showed a couture collection far zanier than those ever produced by the original designer. When Marco Zanini debuted his first couture collection for the recently revived Schiaparelli in January, some criticized it for being too literal in its references to collections past. Zanini appeared to take the criticism to heart, showing a collection on Monday in Paris that was again full of references to Schiaparelli&apos;s better known motifs and silhouettes -- but on an exaggerated scale. The show opened with a bizarrely proportioned, double-breasted leopard coat with large, gorilla-like fur sleeves, a heightened turban and pointed brown leather boots cut mid-calf. The boots appeared in different materials throughout the collection, as did the gigantic fur sleeves -- most often in brown, and sometimes in leopard or lime green. Shoulders were sharper and longer than even those shown by Schiaparelli in the &apos;40s, and nearly every look was accompanied by a fantastical hat, though the clothes were whimsical enough without them. There were a few pieces that could be worn safely on the street: gigantic furry clutches in vivid hues; a belted black crepe dress that cut just below the knee; long gloves that ballooned at the elbows, and slinky, &apos;30s-inspired gowns, one in yellow covered with purple rats and squirrels. That yellow dress, in our minds, represents the perfect way to revive Schiaparelli. It expresses the humor and sensibility of the namesake designer -- notorious for covering her dresses in lobsters, flies and human vertebrae -- but isn&apos;t burdened by her (now antiquated) silhouettes and construction techniques. Like Raf Simons&apos;s creations for Dior, it manages to evoke the original designer and feel contemporary at the same time. More of this, please! The designer, who left his job as creative director of Rochas to head up the creative revival of Schiaparelli, is no longer with the label. This was one of those rumors that everyone talked about like it was true, despite the fact that it wasn't actually ever confirmed. But now it is: Maison Schiaparelli finally has a designer--and it's former Rochas creative director Marco Zanini. 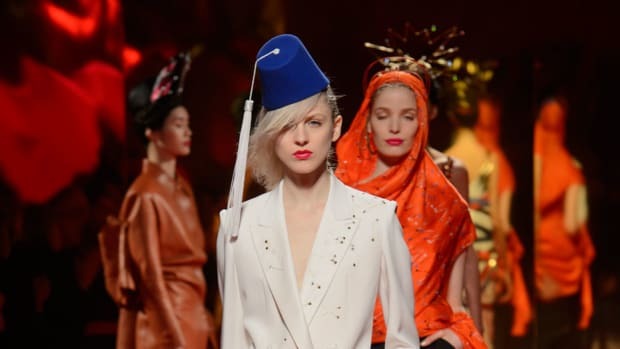 When former Rochas creative director Marco Zanini signed on to become creative director of Schiaparelli in September, he was lured not only by the opportunity to design and show high-end ready-to-wear for the storied fashion house, but also haute couture. That opportunity will soon be realized.